ALL. THE. EVENTS! Check out what’s happening in August. Don’t forget that we are in MicCheck! Season, which continues through October, MicCheck! utilizes the arts to illuminate pressing issues affecting Asians and Pacific Islanders and other communities of color. Visit apano.org/mic-check for the full lineup. Thursday, 8/3: Direct Path to Detour Group Show and Book Release – Concurrent to the creation of the group dance work Direct Path to Detour, which premiered in May 2017, Takahiro Yamamoto invited the project participants and some colleagues to provide artwork representative of their current interests and/or engage in spoken or written discourse based on some of Yamamoto’s writing.This book release event will include artwork by artists featured in the book (books will be available for purchase from the artist for $25) along with soft live DJ sets by Jesse Mejía, sidony o’neal, Roland Dahwen Wu, and Takahiro Yamamoto. 6pm, Compliance Division. Thursday, 8/3: A Village Called Versailles – Film Screening and Discussion – A Village Called Versailles is the inspiring story of intergenerational organizing in a Vietnamese-American community in New Orleans that fights back against plans by the city to open a toxic debris dump site in their community, without an environmental impact study after Hurricane Katrina. 6pm-8:30pm, APANO. Thursday, 8/3: De-Canon Library Opening / First Thursday Artwalk – Come enjoy our pop-up library of books by writers of color, alongside asemic art and visual-poetry installations by Sam Roxas-Chua, Roland Dahwen Wu, Samiya Bashir, and Dao Strom. Full calendar of August events on UNA website. 6pm, UNA Gallery. Saturday, 8/5: De-Canon/UNA present: WORDS [a reading] – A poetry reading in the De-Canon Library space at UNA Gallery. Featured poets: Stephanie Adams-Santos, Neil Aitken, Christopher Rose, Jake Vermaas. 7pm, UNA Gallery. Tuesday, 8/8: Bystander Intervention Matters Communities of Color Unite – This Summer Don’t Shoot PDX kicks off a hosted series of community focused bystander intervention conversations and direct engagement platforms. This month’s outreach is to Communities of Color and those of Asian ancestry. All are welcome though these voices are the ones being centered in this space due to the specific context and necessary experience based subject matter. 7pm, Artists Repertory Theatre. Tuesday, 8/8: Eastside ‘Just Us’ Stories – East Portland Photo Exhibit – We want to explore and document what it’s like growing up in Portland and living in East Portland communities, and to capture our families’ experiences of displacement and resilience. This project will challenge the notions people have of Portland and of young people of color. 4:30pm-7pm, Jade/APANO Multicultural Space (JAMS). Saturday, 8/8: Second Saturday is for Social Justice Show Up 4 Racial Justice – In 2016 Don’t Shoot PDX began hosting our second Saturday gatherings. In the months following it’s exciting to see how small groups gathering and sharing ideas has helped build our messaging for social justice in a way that directly influences relationships in schools, work and community!!! This month’s gathering will be focused IDENTIFYING Social Justice partners in advocacy and support!! 11am. Wednesday, 8/9: Suspended Moment – Suspended Moment captures the human implications of nuclear technology through a sculpture installation, magnified by a Butoh performance, soundscape, video projections, and poetry. 7-8pm, University of Oregon Portland (70 NW Couch St). Thursday, 8/10: KHUN NARIN’S ELECTRIC PHIN BAND & 1939 ENSEMBLE – White Owl Social Club, Pickathon and XRAY FM Present: KHUN NARIN’S ELECTRIC PHIN BAND & 1939 ENSEMBLE (a journey into Thai psychedelia), part of White Owl Social Club’s outdoor summer concert series. 9pm, White Owl Social Club. Saturday, 8/12: De-Canon Workshop + Conversation Day – Poet Neil Aitken will host a generative writing workshop from 12-2pm. Unlearning Podcast (with Béalleka) will host a conversation + Q&A on the topic of experiences of “unlearning”, from 3-5pm. Writing Workshop: 12-2pm, UNA Gallery; “Unlearning” Talk: 3-5pm, UNA Gallery. Saturday, 8/12: Pan African Festival – Oregon’s first ever festival celebrates the presence, resilience, strength and influence of Pan Africans (Africans, Caribbean and African Americans) in Oregon. It is a springboard to community capacity building, to increase understanding within and between communities and to stimulate dialogue and increase awareness and sensitivity. Free. 12:30pm-8pm, Pioneer Courthouse Square. Wednesday, 8/16: De-Canon/UNA present: HAFT-SEEN [film screening] – Come see HAFT-SEEN, a short film collaboration by Roland Dahwen Wu, Stacey Tran, and Jonathan Raissi. 8pm, UNA Gallery. Saturday, 8/19 & 8/26: Jade International Night Market – Join us for the fourth annual Jade International Night Market, where Portland’s multicultural communities come out in full force each August to celebrate one of East Portland’s biggest events! Last year over 20,000 people came out to support local small businesses, community organizations, cultural groups, and our anti-displacement efforts. 5pm-10pm, PCC Southeast. Saturday, 8/19: De-Canon/UNA Event: MUSIC + POETRY [performance] – Exploring the intersection of music & poetry, with: Shayla Lawson, Trevino Brings Plenty, Dao Strom, Anna Vo, Tron 444. 8pm, UNA Gallery. Saturday, 8/26: Physical Education Reading Group @ De-Canon/UNA – Physical Education hosts a reading group in the De-Canon Library for the closing event at UNA Gallery. 6:30pm, UNA Gallery. Friday, 8/25: Portland Premiere of GOOK – In this film by director Justin Chon, Eli (Chon) and Daniel (So) are two Korean American brothers that run their late father’s shoe store in a predominantly African American community of Los Angeles. These two brothers strike up a unique and unlikely friendship with an 11-year-old African American girl, Kamilla (Baker). As Daniel dreams of becoming a recording artist and Eli struggles to keep the store afloat, racial tensions build to a breaking point in L.A. as the “infamous” L.A. Riots break out. Various times and locations. 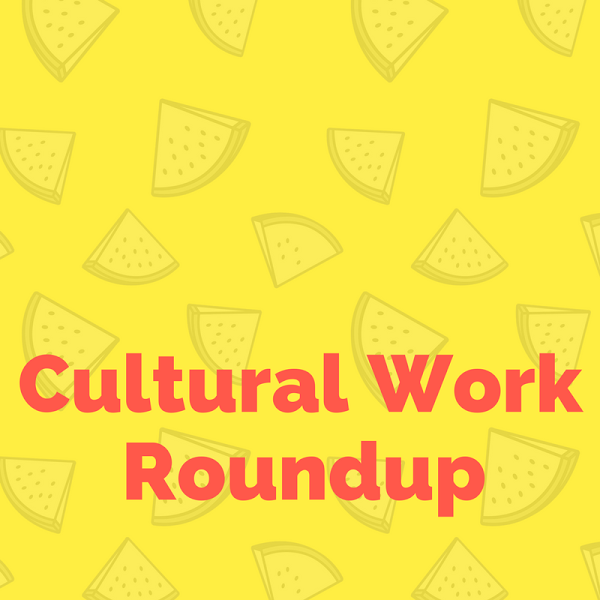 Wednesday, 8/30: TaikoWorks by UNIT SOUZOU – UNIT SOUZOU presents a new annual event, TaikoWorks, showcasing current ruminations telling stories of the here & now through the drum. Commemorating the company’s 3-year anniversary, TaikoWorks will feature UNIT SOUZOU’s professional ensemble and local community group in a work-in-progress performance, and evolves from the company’s boundary-pushing artistry, highlighting their signature fusion of taiko with Japanese folk dance and contemporary performance. This year’s showcase will focus on the theme of goodbyes, from sacred formal farewells, casual everyday parting, and unforeseen, sometimes tragic transitions. 8pm, Jade/APANO Multicultural Space (JAMS). Rapid Response Call for Submissions: BONA FIDE RELATIONSHIPS: Have you found the Muslim Ban as maddening, tragic, and absurd as we have? Well, the Asian American Writers’ Workshop is calling for submissions of creative writing that imagine new narratives, concepts, and futures in response to the Muslim Ban. Full guidelines can be found here. Apply for PICA’s Precipice Fund: The Precipice Fund will continue to award 15-20 grants of up to $5,000 each, for a total of $75,000 in giving, to unincorporated, collaborative, visual art projects, programs, and spaces in the metro areas of Portland, Astoria, and Eugene, OR. Applications open on August 14; applications due October 13. More information here. Apply for the East Portland Neighborhood Office’s Community Activity Fund: This micro-grant program with awards ranging from $20-$500 is here to support your East Portland advocacy, cultural, or community projects. Applications due August 16. More information here and request form here. Multnomah Arts Center Call to Artists: Appear in the Multnomah Arts Center’s Gallery schedule of monthly exhibits! Experienced and emerging artists living in Oregon or Washington (in the Portland Metro Area) are invited to submit group and solo proposals for shows. Applications due September 1. More information here. Border Crossing Identities – Call For Creative Work: amART Project offers the opportunity for everybody to express themselves creatively about the world around them. CALL FOR CREATIVE WORK: For our first call of creative work we have selected the topic of identity and the complexities of our identities, “boarder crossing identities”. Submissions due September 1. More information here. A Blade of Grass Open Call for Socially Engaged Artist Fellowships: We are looking at the process and relationships of socially engaged art projects. Artists receive $20,000 in minimally restricted support. Applications due September 18. More information here.